This CellML model runs in both COR and OpenCell however it does not recreate the published results. Glucose and insulin concentrations do not oscillate over time. This is most likely to be due to the lack of time delays in the CellML model (which are currently impossible to represent in CellML, but are required for equation 1 in the paper). The units are consistent. Parameter values have been taken from table 1 and di=0.06 and Gin=0.54 - as in figure 4. ABSTRACT: In the glucose-insulin regulatory system, ultradian insulin secretory oscillations are observed to have a period of 50-150 min. After pioneering work traced back to the 1960s, several mathematical models have been proposed during the last decade to model these ultradian oscillations as well as the metabolic system producing them. These currently existing models still lack some of the key physiological aspects of the glucose-insulin system. Applying the mass conservation law, we introduce two explicit time delays and propose a more robust alternative model for better understanding the glucose-insulin endocrine metabolic regulatory system and the ultradian insulin secretory oscillations for the cases of continuous enteral nutrition and constant glucose infusion. We compare the simulation profiles obtained from this two time delay model with those from the other existing models. As a result, we notice many unique features of this two delay model. Based on our intensive simulations, we suspect that one of the possibly many causes of ultradian insulin secretion oscillations is the time delay of the insulin secretion stimulated by the elevated glucose concentration. 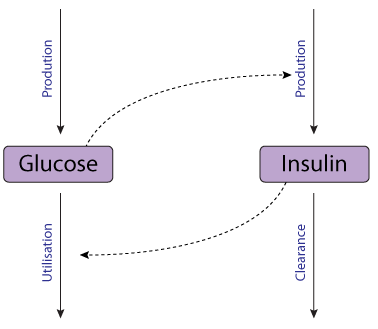 Schematic diagram of the glucose-insulin regulatory system model. The dotted lines indicate that elevated glucose concentration stimulates insulin synthesis and secretion by the pancreatic beta-cells, and also insulin promotes glucose utilisation in muscle, fat and other tissues. Derived from workspace Li, Kuang, Mason, 2006 at changeset 7ed85b69dfcd.